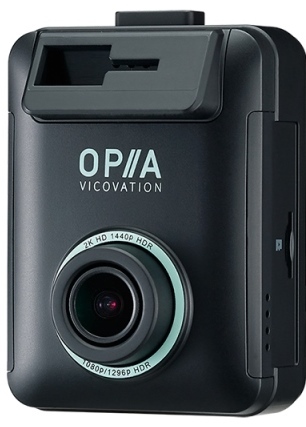 The Vico-Opia2 is one of the latest dash cams from the Taiwanese manufacturer Vicovation. This is a premium camera from a video quality perspective due to the Ambarella A12 processor and Omnivision OV4689 CMOS sensor. It records at a high 1440p resolution with a bit rate of 19Mbps. This produces excellent video during and good video quality at night. Note that some users indicate the reading license plates is easier at 1080p 60fps instead of 1440p 30fps. This camera comes with a G-sensor and an external GPS is optional. The build quality of the Vico-Opia2 is very good and it comes with a 2″ LCD screen. It also has an orange emergency button to lock files. This will save a 1 minute clip in a separate directory which will not be overwritten (30 seconds before the event and 30 seconds after the event). The Vico-Opia2 provides a time-lapse parking mode (photo every 1 second, 10 seconds or 60 seconds) and a buffered motion detection parking mode (records based on motion). To take advantage of this parking mode you will not to hardwire the camera to a constant power source in the car. Another positive feature of the camera is the wide operating temperature of 0°C to 75°C. Because it uses a supercapicitor instead of a battery, the Vico-Opia2 should work well in hot environments. A Circular Polarizing Lens (CPL) is optional and can be used to reduce reflections on sunny days. On the negative side the Vico-Opia2 does not come with WiFi, which is surprising given the premium price point. Also the camera does not have the greatest form factor given its rectangular shape, silver ring around the lens and silver writing on the front of the camera. The camera is relatively small at 72mm x 53mm x 33mm and can be mounted with either a suction mount or adhesive mount. Unfortunately when mounted in a car, the Vico-Opia2 is not as discreet as other available cameras. Our member CheckYourLights has created a review of the Vico-Opia2 on our forum. This camera has just recently been released are there have not been many problems reported yet. While this camera has very good video quality the main drawback is the rectangular form factor, silver lens and writing on front of the camera making it not discreet. While the camera has buffered parking mode, it is surprising that an internal GPS and WiFi are not included given the premium price point this camera sells at. Overall if video quality is your top priority and you can live with the shortcomings, the Vico-Opia2 is a reasonable contender in the dash cam market. Reliability is unknown at this point but in the past, Vicovation cameras have been quite reliable particularly in hot environments. You can read what other owners have to say at our Vico-Opia2 forum. This camera sells for approximately $250. The latest firmware version can be found on the VicoVation site. Final Word Overall a good camera from a video quality and build quality perspective. Not the greatest form factor and high price are drawbacks.